Thank you for sharing the Albers show and also for your musings. A great post. Interesting remark regarding the meditative icons of the 2oth century. I was walking the dog in a downpour yesterday, half looking at how the colors change in a down pour, and half thinking about your ruglets, as you call them. I was noticing that some of the ruglet compositions now hold a space in my mind. And I noted in particular that they are marvelously contemplative. 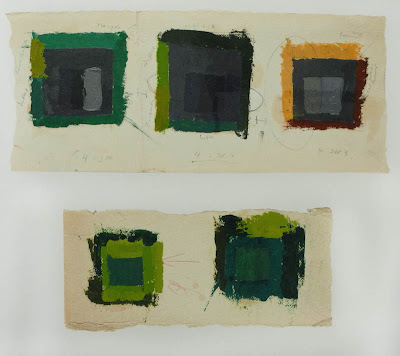 Color relationships and form, but also texture has something to do with it, as with these Albers. 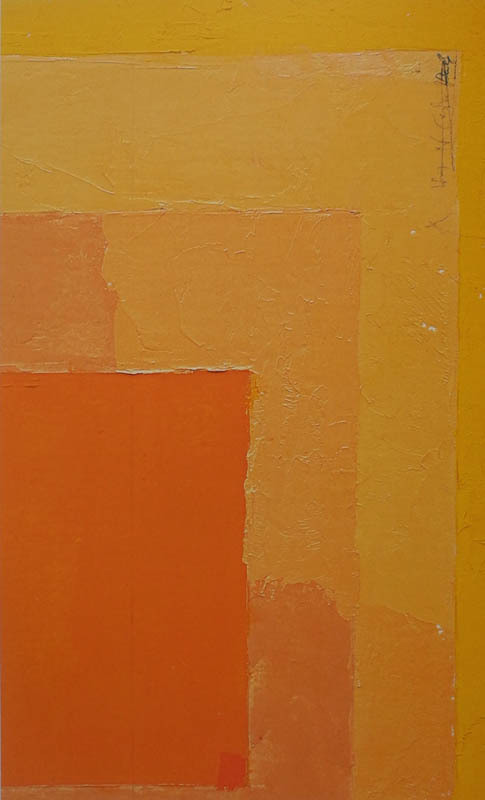 Painting will never die because of its delicious texture. I'm so glad you liked this post, Anon. 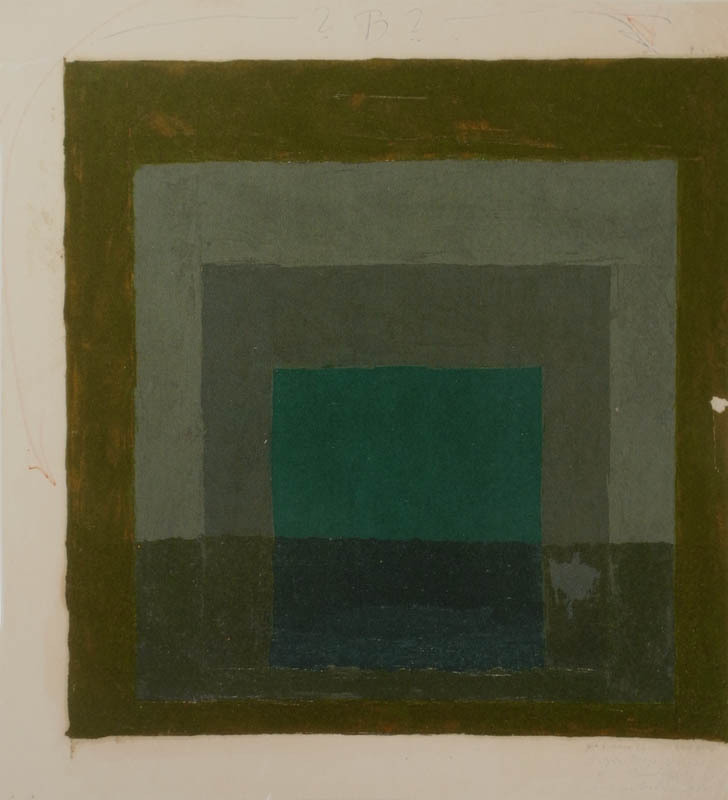 And that you can think of my textile work and the Albers together. 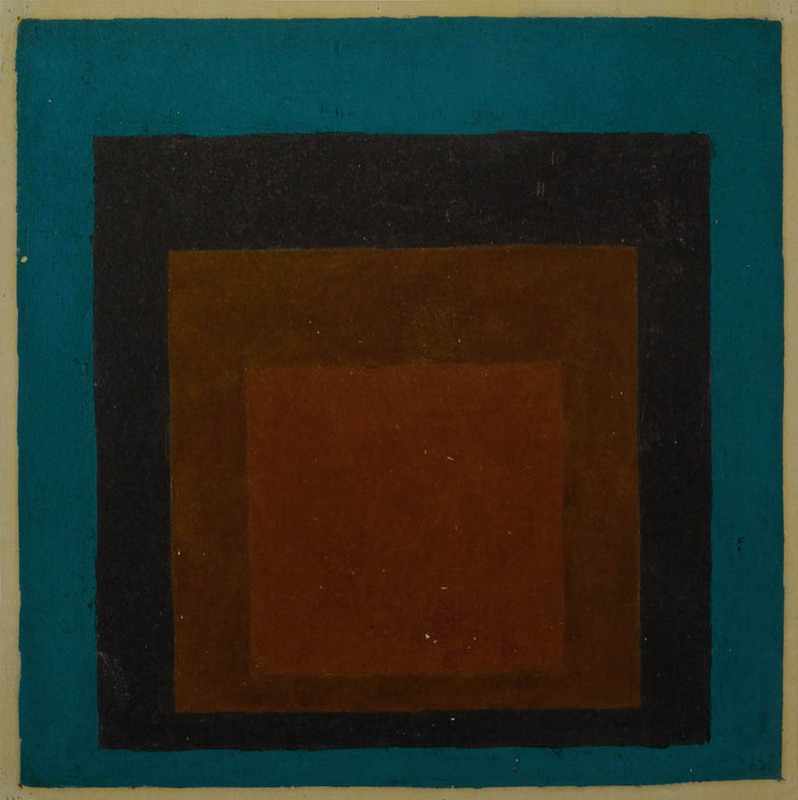 Many of those pieces were inspired by modernist paintings, and I'm sure I'll be doing an homage to Albers sometime soon. I also am sure you're right about painting never dying because of its sensual nature. You might also like some of Robert Motherwell,s writing and musing on color and its poetic qualities. Steven, thanks, I'm glad you like the post; unfortunately the show was over quite a while ago. Regarding seeing an Albers painting: I was recently at the Wadsworth Atheneum, before seeing this show, and came across one of the Adobe series, which I thought very beautiful; I even loved the way it was painted. This was a revelation since I'd never been drawn to his work before. 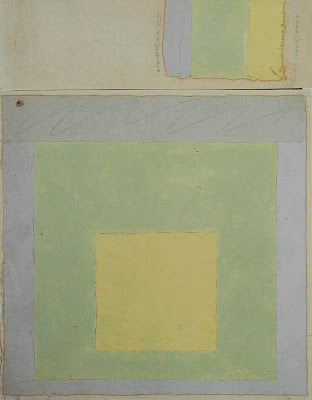 I will look more closely at the next Homage to the Square that I see. thanks, Shannon, and thanks for sharing the post. Such a lovely post. Thanks for sharing this more intimate experience and expression of the man. 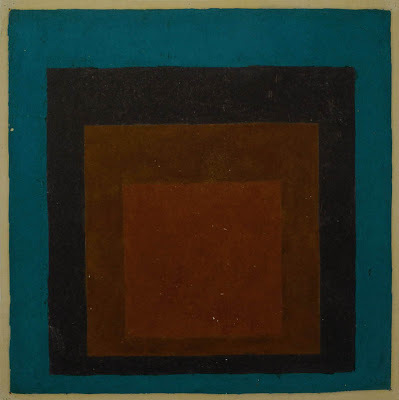 It enriched my day and my appreciation of Albers. Interesting post, Altoon. 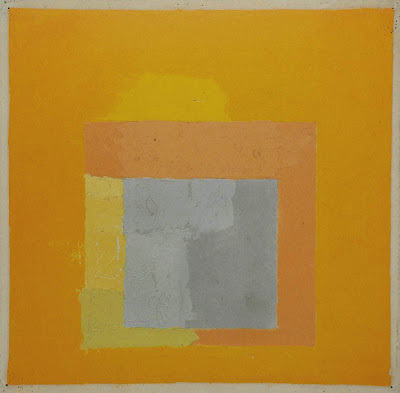 Albers has been one of my heroes. I remember pouring over his portfolio in the locked, security cage in the SJSU library for long periods of time. He used color screened directly onto paper to demonstrate varieties of color interaction. The portfolio, thereby, avoided distortions that interpreting media such as printed ink dot patterns or photographic dyes would introduce. It influenced the work I created for my M.A. 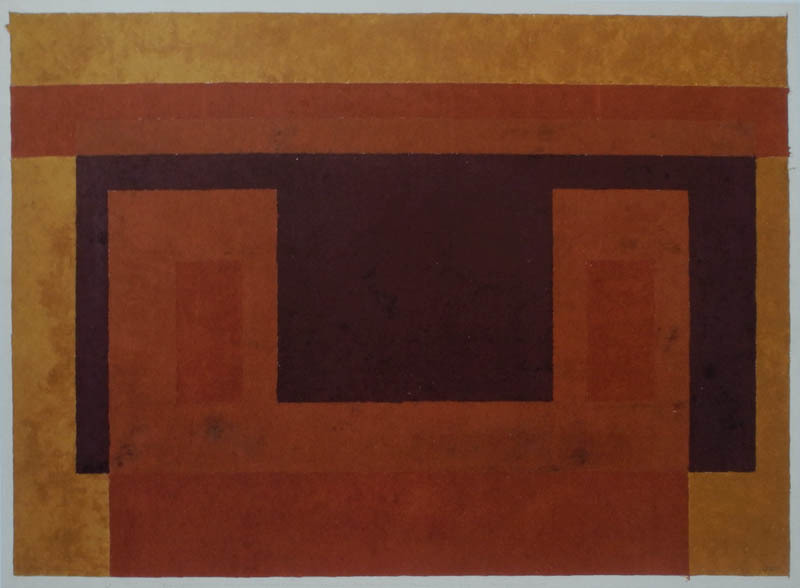 in painting. 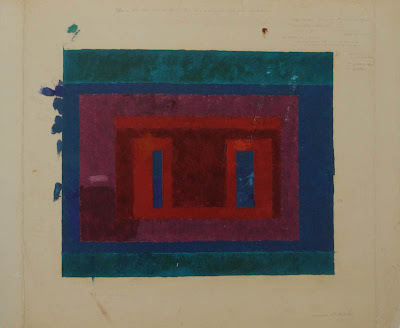 I was fascinated by the flat application of color, without texture or other modulations, juxtaposed only to other flatly applied color, producing a phenomenon that did not actually exist physically. It seemed a beautiful metaphor for transcending limitations of strict adherence to common interpretation of reality. The subtle qualities of emerging recognition, due to what was happening with the color, represents an elevation of consciousness, perhaps the even development of civilization. 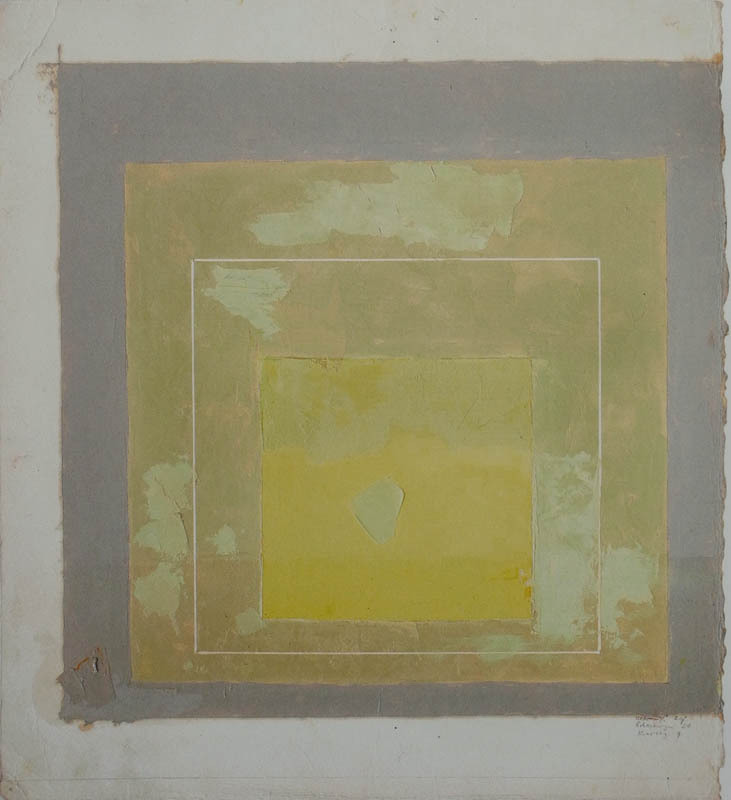 Alber’s ‘Homage to the Square’ series is meditative for me, quietly drawing the viewer in, revealing another level of awareness. Wish I could have seen the show. Thank you for your comments, Celia, craig, and Margaret. 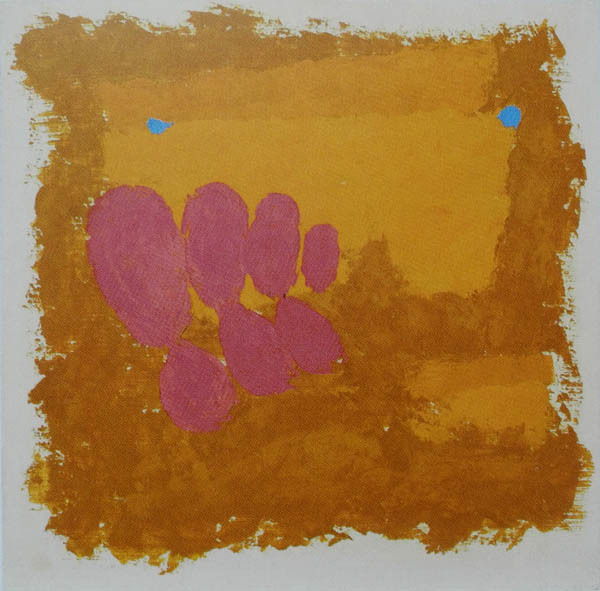 I've never seen Albers' prints, Margaret, and your description is very fascinating, even to your reference to the development of civilization. I'm sure you would have loved this show. Yay, Albers! One of his Homages is among my favorite pieces at our smallish local (Portland, Oregon) museum. 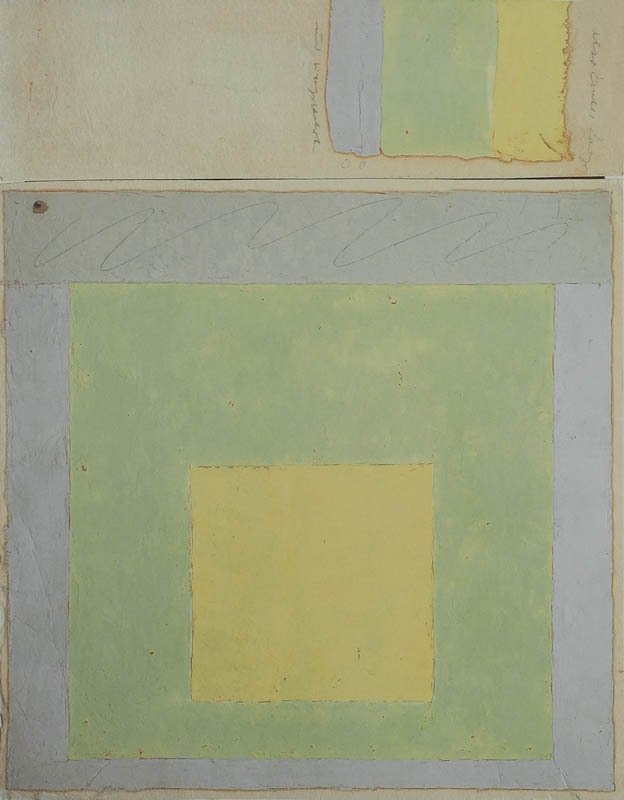 It's "just squares," but - along with the joy of color, of course - the craftsmanship is impeccable.